Once you’ve brought members to your site, you want to keep them for a good long time! This isn’t always so easy to do. People unsubscribe from sites regularly unless they feel that they have a very good reason for staying and continuing to pay. There are several things you can do to guarantee that you’ll keep your members and continue to bring new ones in. The basic key to membership loss prevention is always going to be site excellence. What does site excellence mean? First and probably foremost, site excellence means great customer service. 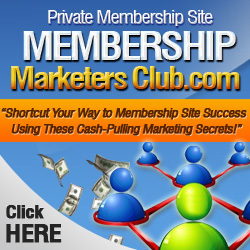 Without it, you’re not going to achieve the success with your membership site that you could have. Customer service predominantly involves being available to your members. This includes answering questions they have about the site, or its content. You also want to have a presence and make yourself available on the forum (you do have a forum on your membership site, don’t you?). Your members will like being able to “talk” to you via the forum – it will give them a feeling that you are truly invested and involved in the success of the site and their success, enjoyment or happiness, whether your membership is in a niche such as health, pet care, gaming, or Internet marketing. Remember to provide your members a way to contact you via email, and to answer questions and requests promptly. This is another key to great customer service. Another way to prevent members from straying is to keep everything on your membership site current, fresh and new. You don’t have to get rid of old content, but you should make sure that it’s kept up to date. Sometimes information changes and you don’t want stale or outdated information on your membership site. Remember also that your membership site should be presenting members with new and fresh content on a very regular basis. Depending on the type of membership site you have, that could mean new videos, articles, images, games, tips and tricks, breaking news, and reports. If people are paying for membership to your site, they are going to want to see new content, or they’ll get bored and discouraged and give up their membership. You can invite members to special events that are members-only. And be sure to let members know that as a benefit of joining, they will receive preferential treatment, such as being given access to content well before non-paying site members or the general public. Conducting polls is a great way to keep members. This lets them know that you care about their opinion and that your intention is to give them the most valuable membership site possible. Membership loss prevention involves going above and beyond in all ways for your members. That’s the bottom line. You’ll find that members appreciate your efforts to be available, and to provide them with some great value for their investment in your site. Remember that keeping members and adding more is all about putting the needs and expectations of your members first, and then taking that extra step in order to gain their loyalty for a very long time.